So, you’re the type of person who wants the knitty-gritty scientific facts about Epay wood? Below you’ll find the results of many thorough and reputable tests conducted by the United States government and other agencies. LOCATION: Epay comes from South America, specifically countries like Brazil. It has also been known to grow in Central America. Epay is extremely versatile, especially when grown in managed forests. COMMON CHARACTERISTICS: Reddish or Olive brown walnut color with a fine to medium texture. Can grow up 150 feet with max trunk diameter of 6 ft. Average height is 100 ft with a diameter around 2 to 3 ft.
Bending Strength: 22,560 psi - This kind of strength greatly increases an Epay deck’s structural capacity. Working Properties: Tough on cheap cutters and blades. Use carbide tipped saw blades. Pre-drilling is necessary. 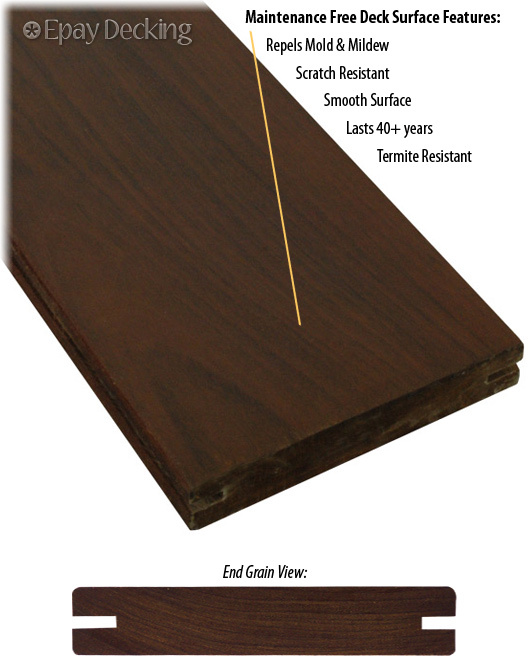 Durability: Epay is resistant to decay, fungus, mold, & termite attack. Lifespan of 75+ years. U.S. FOREST PRODUCTS LABORATORY - Very Durable - 25 years: This is the highest rating available. USES: Decking, Sunrooms, Gazebos, Garden Bridges, Siding, Benches, Adirondack chairs & furniture, truck & ship flooring, cabinetry, flooring, dock, and marina material. TERMITE RESISTANCE - U.S. NAVAL RESEARCH LABORATORY – Highest Rating was awarded due to 15 years in ground without termite attack. FIRE RESISTANCE - ASTM-E84 tested to National Fire Protection Code, Class A, Uniform Building Code, Class 1; Highest Rating. STRENGTH & HARDNESS - ASTM-D143 tested; Eight times harder than California redwood, Seven times harder than Cedar, Three times harder than teak.